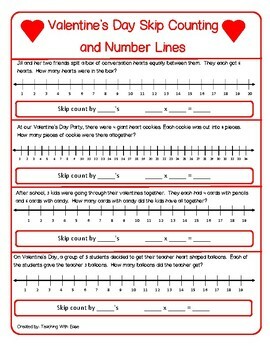 This is a great tool to help students learn how to use the number line and skip counting to solve multiplication problems. They will draw their "jumps" on the number line and then record what they were skip counting by. Then, they will relate that to multiplication by recording and solving the multiplication problem that matches the skip counting on the number line. **If this activity is helpful, please like my store and leave positive feedback. Thank you!